Characteristic 5 – Being close to the customers and retaining their trust as their needs change will be important to unlock new sources of value. Any future portfolio will require access to a diverse portfolio. This will need to span generation, demand and storage or other technologies that can deliver flexibility. Circumstances differ and not everyone needs the same portfolio of generation or the same types of customer. But having access to an appropriate blend of resources will allow for value to be realised through trading activities and for risks to be managed. This does not necessarily mean continued ownership of the assets by the energy companies, however. In future, a more asset-neutral approach may be expected to emerge. Indeed, this trend is already in evidence, as ownership of generation is diversifying. Initially, this was seen with a wave of independently-owned wind farms, which tend to migrate to management by portfolio players. More recently, the trend has continued as millions of consumers have invested in solar generation. Looking forward, a similar pattern looks set to emerge with growing installation of domestic scale batteries. Asset ownership is becoming more diversified and decentralised to the extent that, increasingly, each house/business or, with aggregation, cluster of houses/businesses could be considered as an asset. The assets themselves may not earn a commercial (or even any) return on the capital investment; as they may become part of consumers lifestyle preferences. As an example of a possible model for the future, Statkraft has built a successful business in Germany based on aggregating renewable generation plants from smaller developers, and offering trading and risk management services. 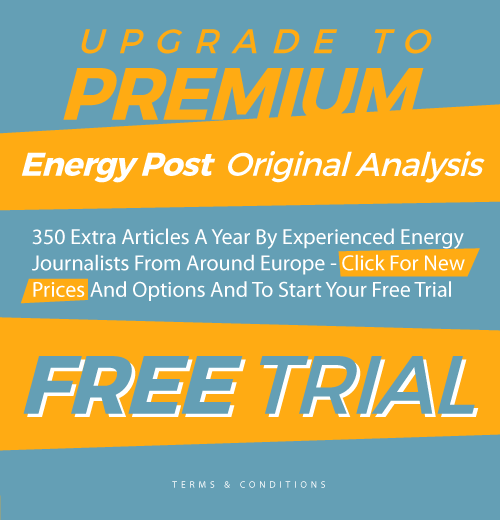 They have over 9.5 GW of wind and solar energy from more than 1,300 sites under contract, which dwarfs its small portfolio of hydro and gas generation in Germany. As a result, Statkraft is the largest direct selling company in Germany and one of the biggest traders in the German day-ahead and intraday markets, without owning any wind assets there. It is notable that their ‘asset-light’ approach is concentrated on portfolio management and trading and risk management, rather than a full focus on retail and the needs of household customers. Ongoing market design changes in Europe are increasing the potential for this model to be applied more broadly. Now that renewable energy has a significant role in many markets, the emphasis is increasingly on integrating renewables into the market rather than insulating them from it. In the European Commission’s recent Clean Energy Package, for example, we are seeing proposals for balance responsibility and, prospectively, removal of priority dispatch for all but the smallest renewable installations. In addition, there is emphasis on future support regimes for renewables structuring payments around their revenues from the wholesale market. Entering into arrangements with an aggregator to provide trading and risk management services in the vein described above is one option available for dealing with greater market exposure. Electricity is the world’s most volatile traded commodity. The true strength of traditional energy companies is their ability to invest in assets with a 20-40 year lifetime on the back of a series of short term contracts. The series of trading, risk management, optimisation and financial and collateral management tools which support this is world class. The complexity and volatility of the wholesale market is a barrier to entry for new players, and existing energy companies will retain a competitive advantage over new players for some time to come in this regard. But the nature of risks within the market is changing. The growth of renewables has increased price risk but has also brought volume risk to the fore. Thermal plants now have real uncertainty over when and how much they will operate, as running patterns flex around renewable generation output with near-zero short run marginal costs. The challenge lies in that the industry broadly continues to trade the same products as ten years ago, which suited the risks faced at that time, but are not geared towards the risks of the future. For example, a decade ago, most CCGTs would be able to predict reasonably well their likely running patterns for the coming weeks, months and even beyond, based on expectations of typical demand patterns and fuel prices relative to coal generators. But today, a CCGT’s output is dependent on wind and solar levels, which are only known in the nearer-term, and so it does not know its likely hourly production profile significantly ahead of real time. Unlike the situation ten years ago, the CCGT now has volume risk, as well as price risk, changing the basis for forward energy trading. The quoted ‘spark spread’ products relates to a profile of generation that has not been seen in most of Europe for 5 years. A negative spread just means that the market is trading the wrong products. New trading instruments are available, though, in the form of options. This is a natural product to complement trading of firm energy. Most generation capacity can essentially be considered an ‘option’ to produce energy. While all production capacity represents such an option, some resources offer greater flexibility than others in how the option can be exercised and how frequently. In an increasingly decarbonised system with high levels of low carbon generation, energy market volatility could be significantly greater, increasing the value of such options. The appropriate response is to ensure that market participants are able to trade energy ‘options’ in the form of a sufficiently broad range of products mirroring the various types of services the market requires. Multiple option variants could be developed to reflect different requirements, such as deliverability and flexibility, and to suit the capabilities of different types of capacity. Moving forward, traders need to find means of packaging risk and managing complexity in ways that will continue to bring in capital for new projects. The new risks need new market instruments to manage volume risk and complement the markets for delivered energy. As an alternative to trading hedges, another possible route for risk mitigation is offered through physical hedges. Tesla provides an example of an integrated model, which now spans electric vehicle, solar PV panels (since the acquisition of SolarCity), and electricity storage through its Powerwall product. Through its Supercharger network, Tesla (until recently) offered free fast charging for its EV owners; and the addition of solar and storage to the mix introduces the possibility for customers to break links with traditional utilities and instead rely on Tesla for all their energy needs. Importantly, this is all under the banner of a well-recognised and established brand. Customers buying into the Tesla product range will have a long-term relationship with the company, given the lifetime of the underlying products themselves. Tesla has the ability to define these relationships such that it can access the flexibility offered by the fleet of EV charging activities, storage and generation assets of its customers. It also has a way in to become the energy supplier for its customers and their Tesla products. Therefore, through its brand and products, Tesla may hope to make big waves in the energy market. Put simplistically, utilities have tended to know their customers as deemed profiles, only obtaining details on aggregate consumption significantly after the event and with very little understanding of their needs or desires. The advent of smart meters and other data processing technologies/businesses offers the opportunity to change this. The dawn of readily available ‘Big Data’ (i.e. the ability to integrate with data from other sources, extending as far as social media) could provide access to much more granular and timely information concerning consumer behaviour and the underlying reasons. This is a powerful new resource. It will allows utilities to obtain a much clearer understanding of consumer preferences and behavioural patterns and, therefore, the needs and requirements of their customers. To make the most of this opportunity, utilities need the ability to effectively access, analyse and process the new sources of data in order to harness the valuable information that it contains concerning consumer behaviour. Based on this, utilities will have the ability to develop propositions that are suited to the needs of the consumer and so capture value. This, in turn, may open opportunities to bundle energy with other services. This theme is picked up further as part of characteristic 5 below. Energyworx provides an example of a company harnessing big data for use in utility sector applications. Energyworx converts data delivered through smart meters and sensors into propositions that its clients can act on. Utility clients benefit from Energyworx’s high granularity information about individual consumers’ energy consumption through faster and more accurate billing to consumers, more precise demand forecasting for planning generation, or better targeted pricing and marketing depending on their customers’ installed energy equipment. Equally, prosumers benefit, for instance, by being better able to judge whether they should consume or redistribute their energy or by being able to compare their energy efficiency against other users from the community. Many customers now expect instant information and feedback via smartphone or internet. Customer service in most industries has moved away from call centres to sophisticated applications and internet-based solutions. Energy companies are adapting to this service model and there has been a proliferation of smart apps in recent years. However, for the demand side to become truly active by changing consumption patterns in response to system conditions, users will not want continuous active involvement. For most domestic consumers, the potential saving even from very sophisticated decision making is low. Typically, households in Europe pay around €2/day for electricity in total, and the saving from optimal consumption patterns is a fraction of that. With (flexible) electric heating or vehicle charging the value increases. For example, to charge a 30kWh electric vehicle battery, the saving based on typical day-night tariffs in UK could be €5 or more per charge. But these decisions will still need to be automated if users are expected to take optimal decisions every day. This requires energy companies to offer excellent, user-friendly and robust automation tools which allow users to retain control. Therefore, decentralised decision making must become automated, and the customers’ experience should not be affected. In this vein, in the UK, npower has partnered with Nest Labs, who specialise in smart thermostats and smoke/CO detectors. The Nest Thermostat learns from the user and programs itself based on this, while also allowing remote control via smartphone. This provides the consumers with energy for heating based on learning from observed patterns of behaviour, while also offering control where desired. German company beegy offers another example where consumers enjoy automated integration of a suite of smart energy technologies behind a streamlined interface. Their service consists of managing a home’s PV panels, Tesla Powerwalls, and EV charging points through a single beegyHUB, whose activities the homeowner can track through a web portal or smartphone app. The company consolidates all beegyHUBs Germany-wide into a single beegy Community. Algorithms allow users to store their energy or feed it into the Community when their consumption dips below their generation capacity. Alternatively, when their consumption exceeds their domestic generation and stored energy, users can also draw on the Community for electricity – at a flat rate that beegy locks in for 20 years. Heating represents another area where smart technologies could enable demand-side response. GlenDimplex, the world’s largest manufacturer of electrical heating equipment, has been focusing since 2015 on this issue through the RealValue project, in collaboration with partners from Ireland, Germany and Latvia. This 3-year project, funded through the EU’s Horizon 2020 program, aims to demonstrate how Smart Electrical Thermal Storage (“SETS”) can, along with a management platform and interface for end users, meet domestic heating needs while also acting as energy storage capacity for the electricity industry. The needs of customers do not always align with the plans of vertically integrated energy companies. The most obvious conflict is over incentives for energy efficiency, which causes customers to consume less energy and, hence, companies to produce and sell less of their basic product. This dilemma sheds light on how a truly customer-focused energy company might approach its customer offering. Ultimately, most successful mass-market business models involve a combination of high-volume, low margin sales accompanied by opportunistic niche sales with higher value. To be sustainable, the higher value sales need to be based on predicting and then meeting customer wishes. The bundling of services may be within the energy sector or extend beyond. For example, cars or appliances may come with an energy supply agreement. Again, Tesla is an example here. Its branding is an essential part of its proposition and its customers feel that they are buying into the brand. Strong brands from the non-traditional, newer entrants into the energy sector may hasten the demise of traditional integrated energy companies, whose own brands have, in some cases, been tarnished by concerns regarding mis-selling to or profiteering at the expense of their customers. Trust in conventional utilities has been negatively affected, as a result. A successful energy business must build a strong relationship with its customers, including trust on both sides, and has to build a good understanding of its customers’ needs. It must come to think of its relationship with customers as part of its asset base, noting that, in a long term business, assets must be carefully managed in order to not be exploited. Taking the above characteristics into consideration, who in the energy sector has this combination of skills today? Arguably, no one. 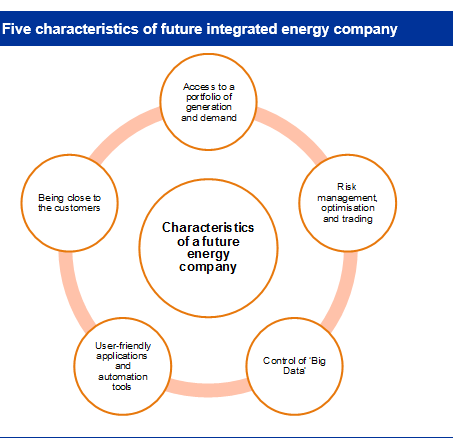 The existing energy companies excel at characteristics 1 and 2: portfolio management and trading/risk management. But how do they defend their businesses from left-field entrants already skilled in Big Data, user-friendly applications and automation tools? They must focus on their existing strengths whilst covering the gaps – and improve their relationships with their customers whilst doing so. What appears to be central to a successful strategy for the future is to focus on the consumer and to place the customer at the heart of the offering. While the sector has always focused on providing energy to meet consumers’ needs, the traditional approach has been for consumers to be passive and for there to be a one-way flow down the supply chain from utilities to consumers. Energy needs have been met, but the consumers and their wider preferences have been largely extraneous to the workings of the markets. Some of Europe’s utilities are seeking to reinvent themselves. RWE has restructured, choosing to bundle renewables, networks and retail into a new subsidiary, Innogy, separate from the conventional generation business (although still under the RWE banner). E.On has also restructured, but has elected to retain renewables, networks and retail under the E.On brand, with the conventional generation business now operating as Uniper. Whether such steps will prove effective in improving their fortunes remains to be seen. It seems unlikely that the newer potential entrants to the energy sector, such as Tesla or Google, will withdraw; having made effective forays and gained traction as mentioned in tradersbible.com The drive towards decentralized energy, with a growing role for demand side response, aggregation and engaged customers has also irrevocably changed the game. Take a strategic view on customer propositions that will work for your customers and on the branding and partnership models that will allow you to achieve them at scale. This article is an abbreviated version of Chapter 2, “Innovation, Disruption and Survival of the Fittest”, of the new book, Innovation and Disruption at the Grid’s Edge, edited by Fereidoon Sioshansi. Stephen Woodhouse (stephen.woodhouse@poyry.com, +44 7970 572444 ) is a director at Pöyry Management Consulting. He heads Pöyry’s Market Design group, which deals with all aspects of energy market policy regulation and design, for private- and public-sector clients. He specializes in electricity market design and the economics of generation, transmission, and interconnection. Prior to joining Pöyry, Stephen was an Economic Modeler for Ofgem. Simon Bradbury (simon.bradbury@poyry.com) is a Principal Consultant at Pöyry Management Consulting with over 15 years of experience in the energy sector. His areas of expertise include wholesale electricity trading arrangements, energy market regulation, and market design. Simon has a particular focus on the electricity market design in Europe and in developing markets. Before joining Pöyry, Simon worked for the UK energy regulator, Ofgem. Good Article. Let’s see how things develop over time. Regulation will play a large role, too. And smart meter data is much better collected at the local transformer outlet for big data use, avoiding all problems with too private data, and reducing the data volume to reasonable levels at the same time (and the number of unsecure data connections which makes the energy system vulnerable shrinks by several digits). This should be the much cheaper and easier approach.